Moksha, which is relief from the cycle of transmigration and attaining the everlasting bliss is the sole purpose of human birth, and this is reiterated in many a scripture in the Sanatana Dharma including Srimad Bhagavatam. Srimad Bhagavatam shows us through many instances that the Spiritual Master – the Guru – serves as the bridge for one to reach the Divine. The Guru shows the spiritual aspirant how to contemplate on the Lord in order to have His vision and when the Lord reveals Himself, what should the aspirant seek from Him. 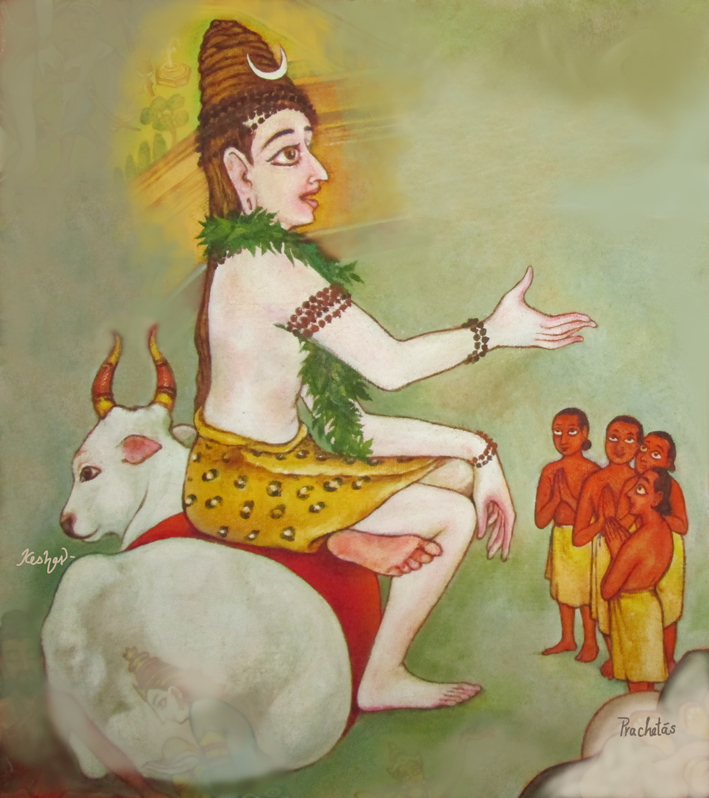 In the 24th chapter of the 4th Canto, Bhagavatam reveals a unique Guru, who is none but Lord Shiva, who leads the spiritual aspirants to the Holy Feet of the Lord and his sermon is called the Rudra Gitam. As the name implies, it is a song sung by Lord Shiva in praise of Lord Sri Hari, thus reiterating the Lord Shiva is indeed the foremost of all Vaishnavas. 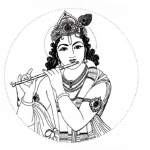 According to Srimad Bhagavatam, the ancient story behind the Rudra Gitam is as follows: The Prachetas were the 10 sons of Prachinabarhis and Satadruti. The Prachetas were known for their understanding of the path of dharma. Prachinabarhis, their father, commanded them to perform tapas in order to multiply their species, as that was their duty at the time. The Prachetas set out westward and as they neared the ocean, they came across a beautiful lake (the present Rudratheertham, a sacred tank in the famous south Indian temple town of Guruvayoor). As they approached the lake, Lord Shiva (Rudra) emerged out of the waters. He understood their purpose and that they were great devotees of Lord Vishnu. Telling them that the devotees of Lord Hari were as dear to him as the Lord Himself, and that to devotees of the Lord, there was none as dear as himself, Shiva then revealed the Rudra Gitam—a hymn that could take a man to the highest goal of liberation—to them. Lord Shiva begins this beautiful hymn with praises and obeisance to the Lord, who he says is verily everything, including even Rudra (himself) and Brahma. Requesting the Lord’s holy vision, Shiva proceeds to describe, from head to toe, the beauty of the Lord whose eyes are like lotus petals, who has extremely attractive eyebrows, face, ears, handsome locks of hair, and dons a yellow robe. Thus he continues his astounding description of the Lord, ending it at His lotus feet that dispel the darkness surrounding one’s mind. Lord Shiva then extols the greatness of Lord Hari’s devotees, who have taken shelter at those holy feet. Shiva states at this point what Lord Yama himself is going to say later in Srimad Bhagavatam – that the devotees of Lord Sri Hari are beyond the sway of Yama, the god of death. Shiva then yearns for association with the Lord’s devotees; he says that he does not consider the attainment of heaven or even Liberation, let alone worldly achievements, to be equal to even a moment’s contact with a true devotee of the Lord. He then prays for the company of such devotees who are always full of love and benevolence and in constant communion with the Lord by listening to His glories, for a life has no meaning if it is not spent in the Lord’s worship. Speaking of the power of the Lord’s Maya and of Time (Kala) that swallows everyone who is steeped in the lust and greed of the materialistic world, Lord Shiva finally emphasizes that it is only those devotees who have caught hold of the Lord’s lotus feet who are free from all fear. 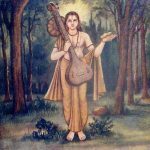 9 Responses to "Rudra Gitam: A Hidden Gem"
whatever lord Shiva has said ,saint Thayagaraja has said in his composition Nidhichala Sukhama? Ramuni sannidhi seva sukhama?nijjamukha valku manasa! which means,The great saint is asking his mind,Oh mind tell me honestly,what gives more happiness,lots of money,wealth,property etc etc or being in the company of the lord and serving him at his feet? Rudra geet is for chanting purpose ..bhakti marg ..
there is no place in bhakti for why and how..
….its like agni which gives heat light energy power at the same time….hardely matters if you knows or not its agni or not…. I was actually searching for the details of RUDRA GEETHAM. Eventhough the actual text is not available in your above web the meaning is clear and fantastic. Thankyou. It really enlightens the true relationship between VISHNU and SHIVA. Which are all in Guruvayur, also corroborate this historical fact. There is a writing in Guruvayur Sri Krishnan Temple that those devotees who worship Lord Sri Krishna should also worship Lord Shiva in nearby Mammiyoor. Lord Siva is happy to see all Krishna’s devotees in Guruvayur.